Facebook new and improved Gifts has rolled out to a small number of users so far, but that's likely to change at the top of next month, when the social network site holds a Gift-focused event in New York City. 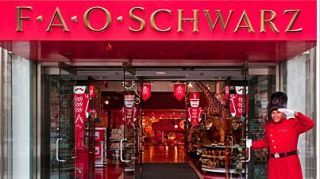 Facebook's press event is scheduled to take place on Nov. 1 in the home of high-end toys, FAO Schwarz. Yes, that's the same Fifth Avenue retailer at which Tom Hanks danced to songs on a giant floor piano. While there's no word as to whether or not Mark Zuckerberg will perform "Heart & Soul" and "Chopsticks" on the famous keyboard, the Facebook CEO should go into great detail about the new physical gift-giving program. Facebook Gifts is expected to get a big push ahead of the holidays, as it's seen as a new way for the company to make money on mobile platforms (we've never written that sentence before). More than half of its traffic accesses the site from mobile's hard-to-advertise-on screens. Partners like Starbucks, Happy Socks, The Honest Company and Cheryl's Cookies by 1800 Flowers are also hoping to benefit from the new giving-and-receiving initiative and the now-one billion users who populate Facebook. With the advent of one new product comes with the demise of another: Facebook Questions for users. A Facebook representative confirmed to TechRadar that the company is retiring its user-based questions-and-answers feature to "focus efforts elsewhere." "Pages and Groups will still be able to ask Questions," noted the Facebook representative. "People will also still have access to their old questions via timeline." This comes at a time when there are more than a dozen question and answer competitors out there. The most notable rival is Quora, which, interestingly, was started by two former Facebook employees, Adam D'Angelo and Charlie Cheever.